Pieces and Elements deals with the fluid borderlines between a scientific, biological, cellular approach to the body and the one seeing the human body in relation to the cycle of nature and the five elements : water, wood, fire, earth and metal. It places itself between a western and an eastern point of view, between visual arts and the performing arts, between installation and choreographic miniatures. 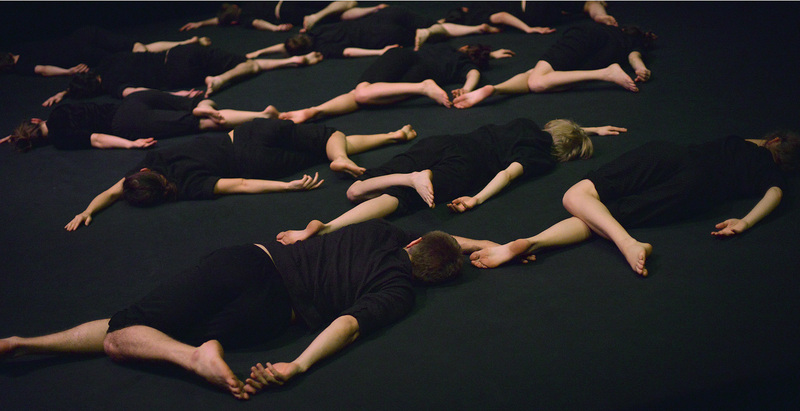 After Collective Jumps, the first part of the trilogy on collective bodies, which investigates the body as a site for forming community, Pieces and Elements considers the phases of change and nature as possible energetic means for becoming one : as body, as self or as a group. Made possible by a long years collaboration with Laurent Goldring. Production : Isabelle Schad. Coproduction : HAU Hebbel am Ufer. Funded by Hauptstadtkulturfonds and Regierender Bürgermeister Berlin – Senatskanzlei – Kulturelle Angelegenheiten. In Cooperation with Hochschulübergreifendes Zentrum Tanz Berlin (HZT). Supported by Wiesen55e.V. Thanx to Lea Moro, Frances d’Ath, Bruno Pocheron, Volker Hüdepohl ; to everyone who participated in the Open Practice Sessions, as well as to my teachers Jochen Knau, Heiko Schwarzburger, Gerhard Walter.